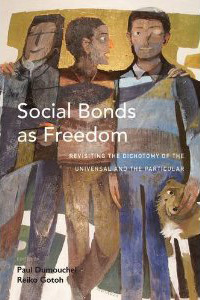 Social Bonds as Freedom: Revisiting the Dichotomy of the Universal and the Particular came out of the international conference “Bonds and Boundaries” that took place at Ritsumeikan University in March 2010. It was organized by Paul Dumouchel and Reiko Gotoh with the help of the Research Center for Ars Vivendi in the context of a research project on multiculturalism and justice. Today, the book co-edited by us and published by Berghahn Books assembles all the papers that were presented at the conference which were extensively rewritten and expanded as well as a new introduction and conclusion by the editors. Social Bonds as Freedom which regroups eleven authors from ten different countries, G. B. Levey (Australia), W. Palaver (Austria), P. Dumouchel, F. Kurasawa (Canada), Anne Phillips, (England), L. Thévenot (France), A. Honneth (Germany), G. Mahajan (India), M. Magatti (Italy), R. Gotoh (Japan), and S. Sassen (United States) and representing five different disciplines – Economics, Philosophy, Politics, Sociology, Theology – challenges one of the central ideas in contemporary thought concerning minority and group rights: the dichotomy of the universal and the particular. Construing the relation between the claims of various groups and cultures and the universal requirements of justice in terms of this dichotomy is not, we argue, the expression inescapable logical distinction but reflects the way in which various groups are partitioned within a larger population. The displacement of this fundamental issue, from a sterile opposition between the universal and the particular to an empirical question concerning the relation of bonds and boundaries which constitutes the central claim of this volume, emerges from relating to each other the different contributions that make up this volume, rather than being a thesis that is explicitly defended in most of the chapters. This thesis clearly emerges from the conclusion that brings together the finding of the empirical enquiries on social bonds and boundaries, of the reflections on the practices of the universal and on the boundaries of the universal in different conceptions of justice as well as of the incursions into a revised liberalism that promotes new relations between the universal requirements of justice and the claims of particular groups.